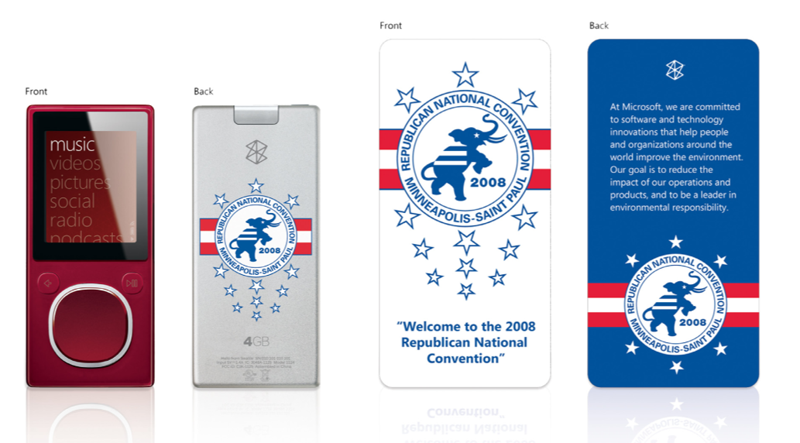 "Microsoft's just slapped together a pair of special edition Zunes for both the Republican and the Democratic National Conventions and they look pretty damn great. The one for the DNC is awarded for the winner of the "Green Delegate Challenge", which is contest for delegations that "demonstrate the highest level of commitment to offsetting their carbon footprint from attending the Convention.". Theirs has a nice looking tree on the back. The RNC's, on the other hand, just has the blurb about environmental stuff as well as the picture of the RNC logo. Oh, and it's red, not green." As we reported back in April, Microsoft is going to have quite a big presence at the 2008 US conventions, with Surface tables and customized Zunes aplenty. This is an interesting strategy in tying these currently "hot" events into Microsoft's hipper product lines, and it's something you definitely wouldn't see Apple trying to do, but is it the right move? Click through to Mobility Site to see both of the designs in full.